Disclosure: This trip to Cambria, CA was hosted but all thoughts and opinions are my own. If you followed along on my Twitter or Instagram, you may have seen that my family and I went on a road trip from Los Angeles to Cambria, California, which is a beautiful town along the Central California coast. Cambria has long been a favorite weekend getaway for my husband and I. Throughout the town there is amazing locally grown food, and a huge array of vegetarian options at the town’s restaurants. There is also some of the best places to get coffee (Linn’s and Cambria Coffee), as well as lots of wineries. Aside from great food and drinks, there are gorgeous coastal views, wildlife, and hikes, as well as nearby Hearst Castle; a major California tourist attraction. We have never been there for a weekend since our daughter was born, but had been wanting to show her Cambria’s beautiful walks and beaches. We found the perfect reason to plan our trip: Disneynature’s Oceans was playing on the Hearst Castle Theater’s 5-story-tall screen! One of our favorite weekend getaways plus a Disney movie equals the perfect weekend for the McDonald family! We began our trip by eating lunch at Centrally Grown, a place with amazing ocean views and healthy food. I had the roasted butternut squash salad. After that, we took a long walk along Moonstone Beach’s boardwalk. The boardwalk is a great place to experience the ocean with toddlers, since you can walk along the whole length of the beach on the boardwalk, so if you’re not in the mood for wet, sandy feet you can have an oceanside walk using the boardwalk the whole way. My daughter loved running on the boardwalk while admiring the ocean waves! 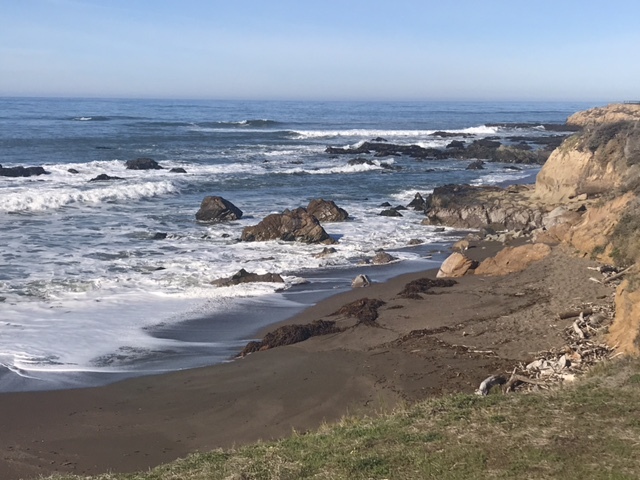 Shortly after, we drove a few miles to Cambria’s neighboring town of San Simeon, which has an area known as the elephant seal rookery, where you can see beaches completely covered in elephant seals! On our drive back from the rookery, we saw zebras along Pacific Coast Highway! The zebras can sometimes be spotted there since they have been continuing to breed since zebras were a part of William Randolph Hearst’s menagerie many decades ago. My daughter was beyond thrilled to see elephant seals and zebras within just a mile of each other! We spent our afternoon exploring Cambria’s east village shops, and having brussel sprouts, a cheese plate, and wine at one of my favorite Cambria restaurants: Robin’s. I love that all the shops there are small, locally owned businesses with great products, unique finds, and the restaurants with amazingly fresh food. That evening it was time for Disneynature Oceans at Hearst Castle Theater! The film is playing every Saturday at 6PM for free until February 24th as part of the Coastal Discovery Stewardship Film Festival. No tickets or reservations needed, just show up! Before seeing the film, enjoy looking out telescopes at the visitor’s center, where you can see Hearst’s Castle from afar. You can also read about some of the history of Hearst’s Castle in the visitors center and the lobby of the theater. Seeing Oceans in such a massive theater was breathtaking! We were reminiscing about our time seeing Oceans while driving along PCH that night, as we headed to our luxurious and cozy hotel Moonstone Landing. Moonstone Landing was complete with a fireplace, spa tub, flat screen TV, fridge, and cozy beds, as well as right across the street from Moonstone boardwalk. The next morning, we grabbed a cup of coffee at Cambria Coffee Roasting Co., as well as coffee grounds to take home to enjoy all week. It was a vacation we will remember for a very long time, and one that my daughter keeps talking about! Being just a few hours north of Orange County and Los Angeles makes Cambria a fun, easy, and relaxing getaway! My Fun-Filled Birthday Weekend Driving a Mitsubishi Outlander Sport!